Almost a generation ago now! 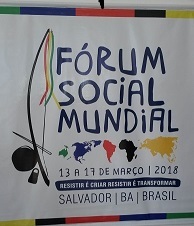 It was in 2001 that the first World Social Forum (WSF) was organised in Porto Alegre, Brazil, the city of the Workers’ Party of future president Lula da Silva and the city of the participatory budget. There was hope, much hope, and a belief that ‘another world’ was possible and that we could shape it. This became the slogan of all future WSFs. There were not that many people at this first meeting, though the fact that almost 15.000 people from all over the world gathered at short notice was a real surprise. Those who had taken the initiative, people from the Brazilian Workers’ Party (PT), intellectuals from Latin America, Africa, Europe and Asia, such as FranÃ§ois Houtart, people from the French monthly Le Monde Diplomatique… It was a real success and one year later they were 50.000 to make the trip to Brazil, with more than 1000 journalists! The World Social Forum was the answer to the World Economic Forum in Davos and wanted to propose an alternative to the neoliberal globalisation.An ‘International Council’ was created in order to strengthen the process and a ‘Charter of Principles’ was written containing the main rules for the events. One of the most important of these principles is that no one can ever speak ‘in the name of’ the Forum. Participants can speak for their organisations, possibly together with others, but not ‘as Forum’. Organisations involved in the armed struggle are not welcome. The Forum wants to be an ‘open space’, something that can be interpreted in different ways and at the same time needs to be seen as a guarantee for ‘horizontality’ â€“ no hierarchies -, self-management and democratic participation of all. After three very successful forums in Brazil, the event left for Mumbai, India, with as much success. Nevertheless, the first small cracks came to light when the anti-capitalists, refusing to envisage even the slightest compromise, organised their own anti-imperialist forum, parallel to the official WSF. Afterwards, we had a ‘polycentric’ Forum in Caracas, Venezuela, Bamako, Mali and Karachi, Pakistan. One year later we moved to Nairobi, Kenya, which was not a success because of a failing organisation and a lack of resources. We went back to Brazil with a gigantic Forum (150.000 people!) in Belem and the focus on the Amazon region and its indigenous people. We tried Africa once more but again the organisation was below zero. But the cracks kept emerging and the global left appeared to be as weak as its national counterparts: bickering, ego’s, divergent philosophies … the European forums did not survive the endless squabbling. The belief in ‘another world’ came under threat after the events of 11 September 2001 and almost disappeared with the financial crisis of 2007-2008. The WSF continued to gather, but became less dynamic. The Arab spring gave new hope and we organised an excellent Forum in Tunis in 2013 and another one in 2015. The Canadians proposed a new formula for the WSF and organised one in Montreal in the summer of 2016. It was fine, but there were hardly any organisations involved. As is the case for many young people today, its philosophy was focused on individuals with little vision of the global world. It has often been said that the main problem of the WSF is the opposition between NGOs and social movements. NGOs are said to be reformist with little or no contact with their basis, whereas social movements are supposed to be revolutionary and very popular. I do not believe this. Some NGOs are very revolutionary and some social movements know perfectly well how to keep their members in line. A first real problem is the failing and vague definition of the ‘open space’, including its intrinsic ‘horizontality’. These are attractive principles but they do need a concrete meaning. In any place where people are gathering, in small or less small groups, power relations will exist and these have to be monitored in a democratic way. If the ‘horizontality’ means that the really existing hierarchy remains hidden behind a non-defined principle, problems with accountability and transparency will necessarily arise. If structures are so complex that no one knows who has to do what, misunderstandings are inevitable. A small group withinÂ the international council continued to request a light structure with clear responsibilities and transparency, to no avail. Those who have power, especially if it remains invisible, will not accept any changes. A second problem is that some of the Brazilian ‘fathers’ of the Forum fear political positions. [iii] Even if the first Forum was organised just before the elections that made Lula president of the country – and promoting his candidacy – today, there is a tremendous fear of touching anything political. This obviously is very absurd when one wants to shape ‘another world’, but it does lead to a permanent struggle between a small club of ‘fathers’ and the many dynamic and younger members of the international council. The former do not want to organise general forums anymore and instead focus on thematic forums, such as on water, migration or nuclear matters. They keep focusing on diversity and the idea of ‘convergence’ makes them shiver. The third problem, finally, is purely material: a lack of resources. A meeting of the international council will easily cost around 100.000 euros, except if all pay their own ticket. The budget for the forum in Salvador is around 2.5 million Euro, a very modest amount compared to previous forums. The fact that the international council paid tickets for many of its members made it very easy to make alliances. Now that this has stopped, it is only the more autonomous members who remain and can put the ‘old guard’ in a minority position. Financial constraints, all over the world, make it very difficult for many movements to make long trips. It explains why the last forums may have been a success but were not really ‘global’ forums anymore. The participation of Africa has dwindled, Asian participation has almost disappeared. A very interesting cooperation with the Federal University of Bahia, a public establishment with more than 200.000 students, is very promising. After the international council meeting, we had an international conference with activists and academics, with very good results. For the rector of the University, this is a unique opportunity for reaching out to society. The opening ceremony was particularly moving, with, obviously, many discourses, but also lots of music, theatre and poetry, and lots, lots of politics. These are politically difficult times for Brazil, the memory of the military dictatorship remains vivid and moreover, in the same way as in other parts of the world, a struggle needs to be organised against budgetary cuts in education and research. The collective in Salvador has succeeded in bringing together thousands of organisations for preparing the Forum, trade unions will be massively participating, the slogan is ‘to resist is to create, to resist is to transform’. In the same way as in the past, the Forums offered an opportunity to directly listen to Chavez, Lula, Correa and Morales, it is now envisaged to invite Jeremy Corbyn and Bernie Sanders. The WSF is not the only global Forum. Thanks to the many initiatives that were taken from the 1990s onwards, many thematic networks have been created and they continue their very useful work. But the WSF is the only global transversal gathering where different groups can discuss their objectives, their strategies and their campaigns. There is now a general understanding that climate justice is not possible without social justice, that peace is not possible without climate and social justice and that media play a very important role in all these sectors. It therefore is urgent to sit and plan together. In Mexico, a major Forum on migration will be organised in November 2018 and we all know that labour law, climate change and peace will have to be discussed there. Too many movements have now withdrawn to the local level and have forgotten that local and global levels are not opposed or hierarchical. They need to go hand in hand. Moreover, in Europe a new tendency to put up more barriers is growing, whereas we need the opposite. The WSF can make an important contribution to this. This Forum can be a new start. The old guard of the opponents has certainly not disappeared and one may expect it will make itself heard once again after March 2018. That is why major mobilisations in Latin America, Europe, Africa and Asia are very important, because yes, another world is possible. Does anyone believe the world today is in a better shape than fifteen years ago? That the demands of the alter-globalist movement are now irrelevant? We should not be afraid of politics, on the contrary. But we have to act as adults, forget all egocentricity and learn to search for what we have in common. Today, some global initiatives are worth defending, such as the social protection ‘floors’ of the ILO, or the Sustainable Development Goals of the United Nations. But these certainly deserve a boost from social movements in order to make them really transformative. Hopefully, many movements and people will participate in the Forum, directly, in Salvador, or at a distance, thanks to the new technologies. The very interesting local initiatives, in Europe, Africa or Asia can learn from what is happening in Latin America, and vice versa. Working together, movements are strengthened and better able to tackle the dominant system. If the World Social Forum succeeds in giving a voice to many different voices, in helping movements search for their commonalities, respecting their diversity, this Forum can play a major role. [i] An extensive literature now exists on the World Social Forum. Here are mentioned some of the first and most important books : Fisher, W.F. & Poniah, T., Another World is Possible: Popular Alternatives to Globalization and the World Social Forum, London, Zed Books, 2003; Polet, F. (ed. ), Globalizing Resistance. The State of Struggle, London, Pluto Press and Louvain-la-Neuve, CETRI, 2004; Pleyers, G., Alter-Globalization. Becoming Actors in the Global Age, Cambridge, Polity Press, 2010. [ii] For a kind of overview, see Boaventura de Sousa Santos, ‘Indispensavel Reinvenco’ in Carta Capital, 18 Outubro de 2017, p. 40. [iii] To better understand the origins of the WSF, read Milciades Pena, A. & Davies, T.R., ‘Globalisation from Above? Corporate Social Responsibility, the Workers’ Party and the Origins of the World Social Forum’ in New Political Economy, 2013.